I tried another loaf cake using the Muffin Formula this afternoon. It only took 40 minutes to cook and is on the smallish side. 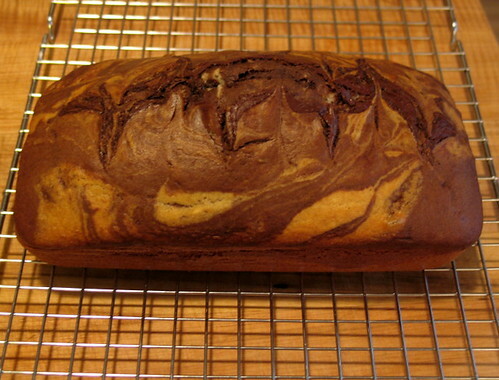 This isn't entirely surprising since this one was a chocolate marble and the other one I did was an apple loaf. The extra bulk and moisture of the apple led to a longer cooking time. I just thought I'd mention so that anyone trying out the loaf conversion for a muffin recipe takes this into account and watches the time carefully on the first experiment. For myself, I will just make a bit more batter if I make this again and then I'd expect it to take closer to the full hour.